In the same week that Romney’s secret videotape was leaked, where he revealed his ‘off the cuff’ (read: from the bottom of his heart) remarks that 47% of the country who would vote for Obama “no matter what,” are freeloaders relying on the government, and not hard work, to succeed, The New York Times printed one of its most inspiring Sunday stories in the last year. To sum up: In 2005, a group of anonymous donors pledged to pay up to 100% percent of state college tuition for any high school graduate within the Kalamazoo district. Kalamazoo has high high poverty rates, and many many children come from families where their parents do not have a high school education. 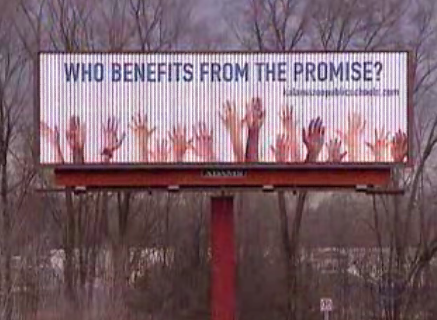 The Promise was not just an altruistic gesture, but an experiment, one that would hopefully boost the economy around it. “High-school test scores in Kalamazoo have improved four years in a row. A higher percentage of African-American girls graduate from the district than they do in the rest of the state, and 85 percent of those go on to college. The measure has also improved the economy. School enrollment has gone up, and new schools have been built. The success of Kalamazoo has encouraged surrounding areas to compete with its success, strengthening the rest of the region. Furthermore, while there was a steady trickle of ‘white flight’ from Kalamazoo to the wealthier suburbs of Portage since the 1970s, since the Promise, that suburban flight has stopped, and the demographic mix in the school system has steadied. Of course, not everything is rosy. Many of the students have difficulty finishing four year college degrees due to lack of preparation and resources that students from college-educated, middle-class families take for granted. To that end, the director of The Promise Janice Brown is working on strengthening early-child education so that students are more prepared for a rigorous college environment. Now that they have the resources, this might prove possible. Romney’s comments may have been focusing on income taxes, but they had broader implications. Part of the dialogue of the right is that when wealth is shared, people become lazy. They aren’t inspired to work hard when things are given to them. The Kalamazoo Promise strongly suggests that contrary to this belief, when young people are given the ‘promise’ of opportunities that were once barred to them because of economic disadvantages, they take them. In the past year, the Occupy Movement has made much of the inequity of a system where 1% of the population holds the majority of the wealth. Does the Kalamazoo Promise reveal all the progress and good that can happen when the 1% shares?